The case of the disrespectful Congress person. In 2008, during the "infamous" Bush II Administration, some of you know I wrote a book called Taxation Without Representation: Can the US Avoid Another Boston Tea Party. You can bet if sales were through the roof, I would have a claim that I started the Tea Party Movement. Instead, I merely herald it as a gift from many to us all. In 2010, I released an up-to-date version of the same book, but so much has happened since 2008, the book is 50% larger and unfortunately, it is 50% more in price . The premise of the book is that our representatives have stopped representing us and thus, we are in many ways where we were in 1776. Has anybody seen Ben Franklin lately? We need him back and then some. There are some in Congress who are oblivious to the needs of US, and there are others who just have no time for US, because of the caring that they must do for themselves and their own good fortunes. 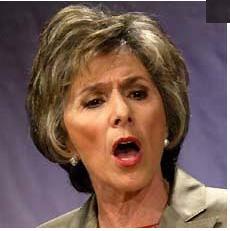 Is Barbara Boxer one of those? How about Diane Feinstein or Nancy Pelosi? I don't consider the self-proclaimed decider of the undecided legends, snopes.com as the ultimate decider on anything but I appreciate their opinion. The email bag was biting at itself to let this one out to the public even without a Snopes check. Surprising to me, Snopes offered its "correctly attributed" stamp of approval on this email that I am about to show you. I'll get there in a second. Americans over the last 100 years perhaps have loved going to California because God has given that state so much beauty, a regular person can just go outside anywhere in that state and be in awe of what God has created. Unfortunately, California has a lot more work to do to get any respect or awe over what it does for itself. This email is representative of the type of people Californian's seemingly believe are the best to run their socialist state. It should be lots better but with folks like Barbara Boxer and Nancy Pelosi both heralding from the Golden State, it is better to expect little. Perhaps you remember this scene in the Senate. Barbara Boxer was holding a hearing and she was querying a Brigadier General? This silly General (her opinion deduced from Ms. Boxers remarks) made the big mistake of addressing Ms. Boxer as "Ma'm", and she blasted him with an immediate correction and the desire for an apology. Ms. Boxer said that she'd "worked SO hard to earn the title, 'Senator', so please to use that when speaking to me." My representation of the quote is fairly accurate. I thought you would appreciate seeing this letter that I got in my email basket. When you have a chance, read the letter sent to Sen. Barbara Boxer from an Alaskan Airlines pilot below. Many of us witnessed the arrogance of Barbara Boxer on June 18, 2009 as she admonished Brigadier General Michael Walsh because he addressed her as "ma'am" and not "Senator" before a Senate hearing.. Your reaction to the general shows several things. First is your abysmal ignorance of all things military. Your treatment of the general shows you to be an elitist of the worst kind. When the general entered the military (as most of us who served) he wrote the government a blank check, offering his life to protect your derriere, now safely and comfortably ensconced in a 20 thousand dollar leather chair, paid for by the general's taxes. You repaid him for this by humiliating him in front of millions. If you care about the way our Country is heading, Please circulate this to remind every voter that the "cesspools" MUST be pumped out when we go to the polls in November, 2010. I might add that the cesspools are not quite emptied and America needs your help to finish the job in 2012.